“We decided not to work in Badin as enough support was promised for the district. It was among the first severely damaged districts and because of the presence of a high profile MNA/Speaker it got media and donor attention. So we decided to work in Khairpur in the North where we are based and were requested by the DCO for support, and in the South in Mirpurkhas as we have an office in Hyderabad and Mirpurkhas is easily accessible from there. In Khairpur, our teams are registering affectees and distributing food bags and tents. Till yesterday (Sept 15), we distributed 1,857 food bags, 1,074 tents, 363 mosquito nets and 145 kitchen sets. We have also started installation of temporary latrines where displaced population is sitting without any facilities. 50 latrines in Khairpur and 70 in Mirpurkhas are under process (one latrine costs us approx. Rs 6,000 to Rs 6,500). We are also distributing Jerry cans (20 litre capacity) and water purification tablets (from our last year’s stock). Local volunteers are explaining the process to the communities. Needless to say that there is a great need for food. Since the rain has stopped for the last two days, dry food bags can be distributed. A bag containing basic essentials for 10 days for a family of six will cost around Rs 3,000. Distribution will be a challenge because people are behaving in a hostile and rowdy manner. Briefly speaking, in Khairpur three tehsils, Thari Mirwah, Faiz Ganj and Nara are severely hit by heavy rains and according to the District Government, 100 % cotton crop is destroyed. In Mirpurkhas all the six tehsils and 41 union councils are badly affected and there has been great loss of livelihoods (cotton, sugarcane and chillies). More than 87,000 houses have been reported partially or fully damaged. Protection of most vulnerable particularly women and children also seems to be one of the major issues. Apart from these common issues, Mirpurkhas has 18 % population from the minority communities (bheel, kohlis, bagris known as scheduled castes) who are landless farmers, wage labourers and are in some cases are bonded also. These communities are twice discriminated – on the basis of class and also on religion. 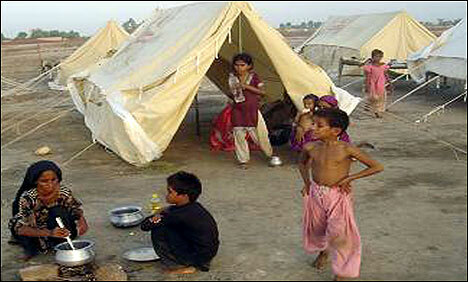 They are the ones who have no homes are sitting on both sides of Hyderabad-Mirpurkhas Road. IRC is working with this community.